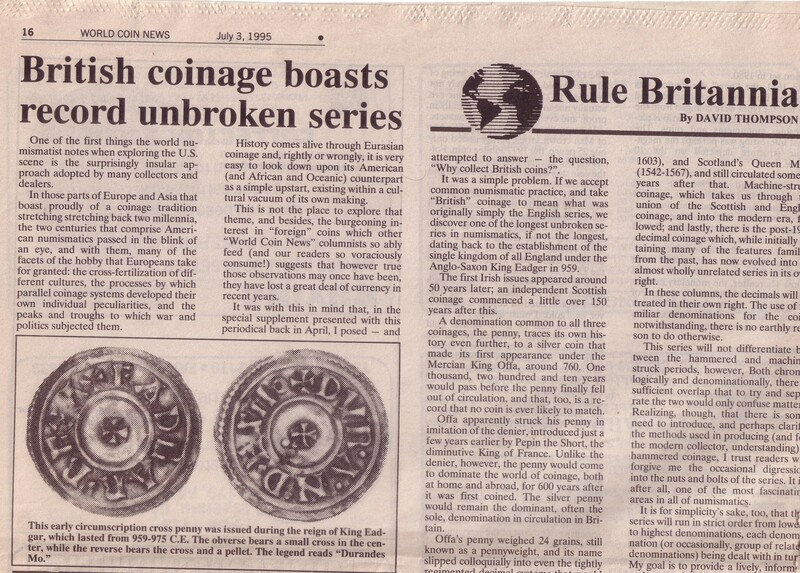 The Rule Britannia series launched in World Coin News on July 3, 1995, and ran unbroken for the next nine years, and a total of 108 installments. An all-encompassing study of the history of English, Scottish, Welsh, Irish, Empire and related coinage, Rule Britannia was awarded “Best Column in a World Commercial Magazine” by the Numismatic Literary Guild in 1998. Rule Britannia – Britannia rules the waves. Well, that’s what the song says. But, of course, for a long time, she ruled the land as well and readers of a certain age might well remember when great swathes of the world map were colored red, to identify them as members of the British Empire. It is these holdings that we will be looking at over the next months, the vast and, in many cases, vastly romantic lands that constituted the greatest Empire the world had ever seen, one upon which even pedantic astronomers and geographers had to admit, the sun never set. Of course, as the 20th century progressed and ideas and ambitions shifted, the Empire itself fell away, both as a political entity and, even a political desirable, to be replaced by the British Commonwealth of Nations. But still it is a story that has filled many, many history books, while it can also be told through the coins that were struck – often by the British Mint itself – for use throughout the myriad lands that comprised this unique aggregation. The first coins ever struck for use in Britain’s foreign holdings are, of course, open to dispute. There are contenders from both the Roman period and, a thousand years later, the medieval “Anglo-Gallic” series. Britain retained holdings in France until the reign of Queen Mary (1553-1558), with the mint at Calais in operation for much of that period. It was during the very last years of the reign of Mary’s successor, Queen Elizabeth I (1558-1603), however, that the first explicitly “foreign” coins were struck, when the ambitiously titled trading company, the Governor and Company of Merchants of London, Trading to the East Indies, issued the four now supremely rare coins that numismatic history describes as “Portcullis Money” – for the crowned device that appears on the coin’s reverse. These coins were issued as a direct requirement of the Trading Company’s charter, which granted them an annual export of up to 30,000 pounds sterling – far more than the existing laws of the land regularly permitted. To circumvent this legislation, the charter demanded that no less than 6,000 pounds sterling should be derived from foreign (usually Spanish or Dutch) species, recoined into new pieces of the Portcullis type. The Portcullis Crown, as the largest of the four coins is most commonly known, was in fact denominated at Eight Testernes, or One Dollar, denominations that had no equivalent in the British pocket, but which made perfect sense in foreign trade. Three fractions were also produced, valued at Four, Two and One Testerne. These similarities to Spain’s “Pieces of Eight,” of course, was deliberate – the four coins were struck to exactly the same weight and standard as the Spanish pieces. The reverse of all four coins bore the aforementioned crowned portcullis, together with the legend POSVI DEVUM ADIVTOREM MEVM (“I have made God my helper”), abbreviated down on the smaller denominations. The obverse depicted the English shield, crowned, with the similarly adorned letters E.R (Elizabeth regina) on either side. The obverse legend was ELIZABETH DG ANG FRA ET HIB REGINA. Struck at the Tower Mint, the first issue of the required 6,000 pounds sterling worth of Portcullis money was made in 1600. It was an abject failure. British influence in the East Indies was still in its infancy, and regional traders simply did not want to accept these new, unfamiliar, coins, when the Spanish Eight Reale was already well-established. Indeed, it would be close to two centuries more before any other Trade Dollar, Austria’s Maria Theresa Taler, came close to rivaling the Spanish piece in the region, and the Trading Company swiftly sought out ways to avoid having to repeat the issue in future years. Despite the series’ short and disastrous life, many older catalogs list Portcullis money as a forerunner of the coinage that Britain began producing for use in India later in the 17th century. Clearly, the inference was made due to the involvement of what would, of course, become the East India Company. In fact, the Company did not even undertake its first trading voyage to India until 1608, by which time Portcullis money had long since been abandoned. It is unlikely, therefore, that India ever even saw the coins!